Tonight at 6pm PST/9pm EST, the Land of Odd will be premiering a new video on our Twitch channel at http://twitch.com/vrykerion where I will be playing The Chosen RPG, a super cheap, super fan service-y, super generic RPG Maker that I had to pay actual money for instead of downloading off some random forum. Come and watch as I easily walk through wave after wave of enemies after the game gives me the legendary best weapon after a single dungeon. Well, if there’s one thing the Land of Odd has been getting popular for its these Story Summaries. Quick and easy chunks that bring you up to speed so you don’t have to go through the grit of each and every patch/expansion/questline to get the feel for the tale. And hey, if there’s one gaming series that needed a skip button – It’s Kingdom Hearts. Not that Kingdom Hearts is bad. It’s just frustrating to play every entry in the series. Before the recent 1.5 and 2.5 collections, you had a series that spanned the GameBoy Advance, Nintendo DS, Nintendo 3DS, Playstation Portable, Playstation 2 and iPhone/Android devices. Not only is that a lot of gaming hardware, it’s also older hardware that might not be so easy to acquire anymore. Thankfully, the updated collections for the PS3 and PS4 have managed to bundle most of the software in a single place for your playing enjoyment. But what if you don’t want to play Kingdom Hearts the Card Game? Or figure out how to level up your Command Deck? You don’t want to be lost come the recently announced 2018 release of Kingdom Hearts III! Well, this guide will help you. You can find the Kingdom Hearts Story Summary (In Chronological Order) page right here. You can find a spoiler free timeline of the games here. The Story Summary page also includes a new thing – a FAQ section. You can send me questions about Kingdom Hearts and I’ll see what I can do to answer them. I know the series can get kind of confusing at points. You can send them to me in comments, via twitter (@Vrykerion) or on Tumblr (Vrykerion). I’ll just say this now so you can either click away or tell me I’m wrong right away instead of getting to the bottom: I. Loved. It. Idris’ imposing charisma and gravitas as Roland, McConaughey’s sleazy and menacing presence as Walter/Randall/Man in Black, and just the amazing visuals of Midworld or the connection to the rest of King’s works all shining through in this short trailer. It definitely delivers on everything I would want from a film adaptation of the Dark Tower series. And I think that’s where there’s some debate going on about the trailer. People aren’t happy that this seriously deviates from the source material so much. People have had issues with the film focusing more on Jake, the movie toning down some of the more western concepts, or them being racists. You know, pick your poison. Overall, I wasn’t expecting a transfer of the books story to the big screen. Because that would be terrible. The story of the Dark Tower books barely fit into anything resembling a traditional narrative structure and more closely resemble a traditional saga where the characters go on a meandering journey to ultimate destination and have various adventures along the way (also see: The Hobbit.) There is no easy way to break The Dark Tower into a simple beginning/middle/end. Heck, one whole book is like 90% flashback. Even the first novel, ‘The Gunslinger’ would work as a straight story namely because it ISN’T one. The Gunslinger is five short stories that take place in a chronological order, but while each of the shorts have a roughly complete arc unto themselves, the whole of the narrative doesn’t. Heck it doesn’t even really have an ending. Not one that resolves any of the conflicts brought forth in the story at least. The other idea put forth about the movie that solves a lot of these conflicts would only make sense to those who have read the entire book series so this next point may have some SPOILERZ in it for those who are interested in reading the books. The idea being introduced and seemingly confirmed by both King and the filmmakers is that this story is another one of Roland’s cycles. Referring to the idea that entire series has been repeated an unknown amount of times until Roland gets it right by bringing the fabled Horn of Eld to the steps of the Dark Tower. When we last see Roland at the end of the last book, his journey has begun once again but this time he actually has the Horn in hand. While the Horn of Eld isn’t seen in the trailer (photos on the set show a horn like object in Roland’s satchel however), it doesn’t mean that this theory is bust. After all, it wouldn’t be the first cycle where Roland lost the Horn. But even Stephen King has hinted on his twitter that this is the next cycle after the books and that this time we’ll see Roland blow that horn and face down the Crimson King. The one point I like about this theory is that it doesn’t tie the film makers to the events of the books. Mid-World is still there, the old familiar faces may come and go, but those are this cycle’s versions of those people. In the same way that Roland remembers Cuthbert fondly instead of bitterly at the end of the last book, we can’t simply assume that the events before or during the course of Roland’s last journey to the Tower will play the same. That means the film makers have full access to the names and ideas presented in the books, but don’t have to use them or even use them the same way in the film version. Combine all that with the fact that you can tell from the trailer that the behind-the-camera team has a lot of love for the property, and this could spell a great time for King fans and non-King fans alike. One final aside that I’ve been pondering on with the trailer: In one shot we see Jake wandering through an over-grown forest in the remnants of an amusement park with a giant broken down sign that reads “PENNYWISE” and a dilapidated statue of a clown holding balloons. Of course, this is easily a reference to Stephen King’s IT that is slated for its own theatrical movie here soon. But something struck me as odd – Is this where the clown came from? It takes many forms in the course of the novel – a werewolf, a mummy, Bev’s Dad – all conjured from the children’s frightened minds and of course Its final physical form of some Lovecraftian horror that could only be described as “Giant Spider-like creature”. But none of the kids were afraid of clowns. Heck, even little Georgie wasn’t scared of Pennywise when they first met. So where did that form come from? We know that It comes from the Macroverse, a place described in very similar terms as Todash Space in the Dark Tower, and Its natural enemy is the Turtle, which is a reoccurring guardian deity in All-World. So perhaps this right here is a hint to where the form of Pennywise the Dancing Clown comes from original. Maybe this isn’t a reference to IT as much as IT is a reference to this. Who knows. Maybe we’ll find out in August. Some may be aware of the recent kerfluffle involving James Rolfe aka The Angry Video Game Nerd posting a video that quickly rose to infamy across the net where he spoke out about how he refused to watch the new Ghostbusters film. The reaction to the video has been mixed and draw heat from many different sides. I’ve seen people calling James ‘sexist’ for not backing the new all-female cast, I’ve seen others stand by him and pledging their support to help him weather the onslaughts of “Feminists and SJWs”, and I’ve mostly seen people chiming in with a just a simple “Is this really what all the huff is about?” And that’s the interesting thought to me. Why is this such a big deal? A guy can just have opinions right? Of course. But how one voices their opinion can sometimes be an opinion in itself. Let me first say that I am in no way condemning anyone with this post. This issue was already a massive clash of a growing cultural divide in nerd culture that predates the announcement of this film’s production. This video was much like that one offhand comment made on a day time talk show that sends the just starting to calm down guests right back in the heat. James doesn’t want to see one of his favorite movies rebooted. That’s fine. We’ve all been there with something. Especially geeks and nerds. I know I pretty much stopped seeing the Transformers movies after the first one. I know a lot of people who didn’t want to touch the newest Ninja Turtles or even the 2003 TMNT movie for pretty much the same reasons. The issue comes from the fact that this movie already had a ton of heat associated with it due to the number of voices decrying it because the cast is female becoming mingled with the voice of people who just aren’t interested, and nothing ever stays simple when gender politics enters the picture. Likewise, I don’t think the gender flip is a bad thing. I’d like to see it done more often – especially with reboots. Explore another side to things. After all, what good is a reboot if you don’t try to do SOMETHING different with it? It might not work, but that’s true with anything. I don’t know if anyone would have wanted to see a shot for shot remake of the Original Ghostbusters either. But the gender issues being brought to the fore front by this remake are a discussion worth having. A lot of ugliness has been brought to bare in the wake of this movie’s announcement and trailers. And everyone who has a personal stake one way or the other in the fight are pretty much coming to this movie with all or nothing mindsets. We win or we die. So perhaps it was a wider view of the landscape that James lacked when making his video. After all, all the video says is that he is going to do a “non review” because he refuses to see it. And why couldn’t they do a ‘good reboot’ like the Star Trek movies (a subjective comparison if I ever saw one) along with the feelings of how he wasn’t wow’ed by the trailer and all the cgi looks dumb. So what’s wrong with that? Why am I even writing this? I can only speak to my problem with the video, one that I have spent several days thinking about what bothered me about it, and say that I honestly think it’s the way he said it. If it had been made as an offhand comment on Twitter in reply to people wondering if he was going to review it, I don’t think this would have been a big deal. But this was a 6 minute video: lighting, camera, editing, visual effects, the whole thing – not just to say but to ANNOUNCE that you are REFUSING to see and review a new movie, on your YouTube channel that is mostly video games and classic horror movies. Oh sure, there’s a few vlogs, but I don’t think that’s what your channel is known for. Just like I don’t need to produce a 5 minute video to tell people that I don’t much care for the new menu numbers are McDonald’s when everything else on my channel is a Let’s Play. Also, ‘refuse’ is a strong word. Refuse usually implies a command or a request that you are not willing to do. If you were working for a paper, and they were sending you to see the movie, then you might refuse. But no one is telling James to go see it. In fact, everything else he describes is just that he doesn’t want to. A personal preference. But the use of the word Refuse in combination with producing an entire video about said refusal, makes it come off like you are taking a stand, protesting, or just straight choosing to be a martyr for the cause of not seeing this film. Which is a bit over dramatic, and I can’t say that is what James intended with this. He probably just wanted to voice his opinion, but the problem there is when you are a public figure – and we cannot deny the importance of the AVGN character or James Rolfe’s contribution to the internet media we have today – that how you say something can doom you. Especially since this wasn’t a VLOG off the cuff thing but a produced & edited video. There was time and thought put into this. So it’s not like you don’t have the opportunity to think about the intent. I imagine that might be what upset some people about this, why others don’t think it’s a big deal, and why others are throwing their unwavering support behind it. Because through it’s language, design, and intent it can be all of those things and probably none of them as well. Am I saying James shouldn’t have made the video? No. He has an opinion and his channel is his to say what he wishes on it. But given his choices when making and releasing the video, there was going to be a volatile reaction. Given his years doing ‘The Nerd’ I’m sure James is not stranger to all kinds of volatile reactions. I also don’t think any kind of volatile reaction (barring threats of bodily harm and any illegal act) should be silenced either. I just wanted to examine exactly why this whole thing even happened, really. Goodness knows James’ ad revenue with YouTube probably just peaked for the year. Oh and as for MY thoughts on the new Ghostbusters? Looks interesting. Reminds more of the cartoon than the movies. Not a bad thing. Will probably check it out and maybe do a write up if I have something worthwhile to say. Final Thought: Just… don’t go into the YouTube comments on these things. That should be common knowledge for any Netizen, but I felt in this case it beared repeating. Seriously. Don’t. So… Episode VII. Wow, who ever thought we’d see this day. I haven’t seen it yet, and I probably won’t until the crowds die down some because I’m old curmudgeon at 32 years and I don’t want to sit in a crowded theater with a bunch of damn kids. (Also, thank you damn kids for continuing to read my ramblings) But I for one can’t wait to see General Thrawn, Mara Jade, Jacen and Jaina all on the big screen. I’m sure I won’t be disappointed. However, a thought did occur to me while trying to avoid spoilers in my online perusing: There is no scenario with this new movie in which George Lucas actually looks better to the fan base. Like at all. No matter what the reaction to this movie will be – short term, or long term (because in the short term people LOVED the prequels, and in the long term… well just google ‘Star Wars Prequels’ and see). And that kind of makes me sad. To elaborate on my point, if the new films are a resounding success (to the fandom, not financially – they are pretty much a guaranteed win financially) then it will be heralded as solid, stone cold proof that George Lucas was an awful and terrible director who ruined his own franchise and it could only be redeemed once firmly removed from his hands. On the other hand, if the movie turns out to be despised and used as a curse the same way “Mass Effect 3’s Ending” is across the internet, then George Lucas will be considered a traitor for abandoning the fans and selling out to Disney whose grubby mousey hands ruined this beloved franchise. 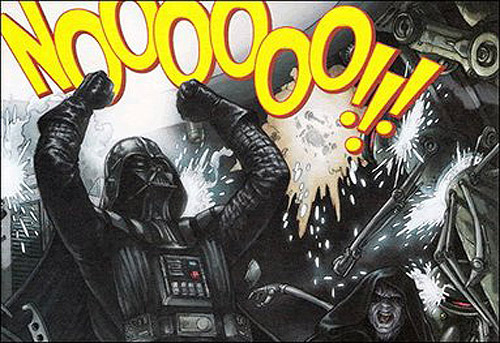 Whoever wins, George Lucas loses and that makes me sad. Why? Because I think George is one of the more inventive world-builders we’ve seen in the last few decades. That was the true gold of the Prequel films in my opinion and one of the reasons I love them so: they built the galaxy beyond a few space stations, two factions, and planets that are wholly a single biome. While the Original Trilogy was a classic tale of good versus evil, it didn’t leave you with much of an impression about what society was like. We saw a few worlds on the fringes that were barely inhabited if at all. Is that the way things worked? Was the Death Star the seat of government? Then why was it just built? Where does the Emperor live? What the heck was the senate that got dissolved in one line of dialogue? We got glimpses of a much bigger galaxy but saw nothing of it in the scrappy dogfights between a totalitarian government and the terrorists that fought against it. The prequels however gave you that. All of that. It explained how we got to the point of this battle of good & evil, how good intentions sent to the galaxy to hell when guided by someone who wasn’t interested in helping, and it built up the mythos in a way that the original films never even touched. I LOVED the prequels because George Lucas went from a classic hero myth of good v. bad and turned it into something that felt like a living galaxy. So if nothing else, this post is for you, Mr. George Lucas. Thank you for the galaxy far far away that I’ve spent 32 years enjoying the heck out of (No, seriously, one of the ways I learned to read as a kid was Jabba’s subtitles). And here’s to Disney’s New Trilogy and may it find success and a place in the hearts of fans new and old alike. May the Force Be With You, and The Force Shall Set You Free.